The Microdermabrasion Dermabrasion was designed by Italian Florence's Mattioli at first, until now had over 20 years’ history. This kind of technology only supplies to the dermatology expert and doctor at first uses, but more and more SPA House & Beauty Saloon also gradually uses, it was called the best method of medical beauty. This method successfully has developed in Europe for several years, and has obtained the extremely satisfactory effect. Now we want to introduce the Diamond Dermabrasion, it is a creative improvement of the Dermabrasion. The Diamond Dermabrasion provided a non-surgical skin refinish procedure, by using sterile diamond heads to abrade or rub off the top skin layer, then Vacuuming out the particles along with any dirt and dead skin back up. This procedure removes skin debris,imperfections, blemishes, wrinkles and unwanted pigmentation on the skin. 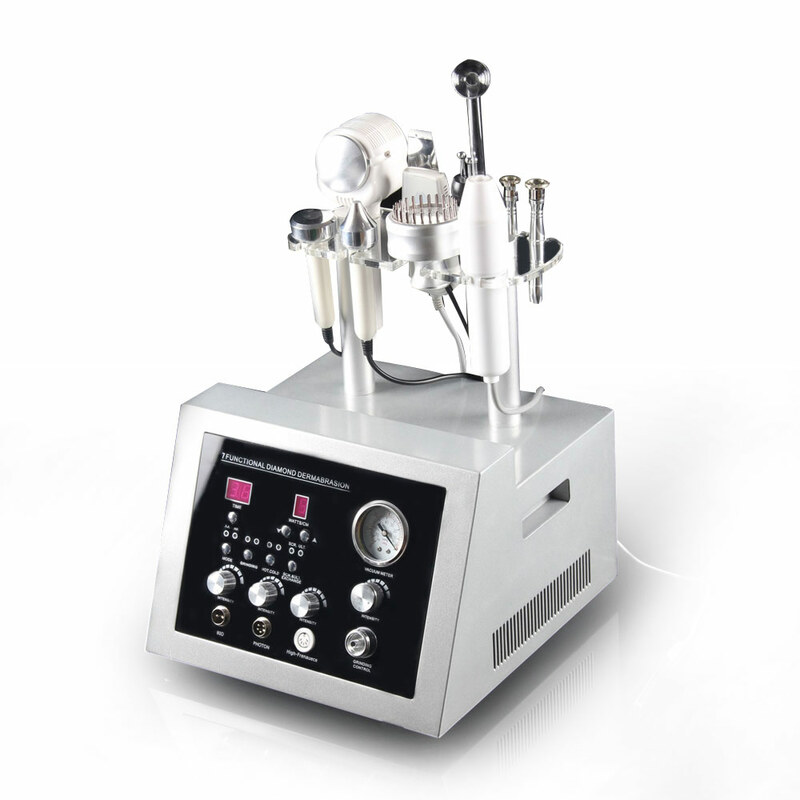 Moderate usage of Diamond Dermabrasion,accompany with skin products that penetrate through top skin layer that reach the dermis level, helps to replenish natural nutrients, restore cell activity, and promote skin health. The results after Micro Dermabrasion is usually a healthy, glowing, beautiful skin. The cold function is specially designed for claming down the skin after peeling. The skin is sensitive after peeling , so the cold procures is necessary. - - The hot function is designed for accelerating the absorption of nutrition. Ultrasound utilizes sonic vibrations; it works one million times per second (1 MHz). The ultrasonic wave could stimulate skin tissue and improve permeability of the membrane to promoted collagen tissue, reduced wrinkle and invisible appeared fine line, also lift the skin result for younger and healthy look. Ultrasonic generate frictional heat which accelerate blood circulation, muscle relaxation, and decompose the cellulite to break down exceed fat. It can help the beautician apply the recover after peeling . Note: Let the client hold the Negative Stick, and then operator hold the ultrasound probe. -Microcurrent is a low level of electricity that mirrors the body's own natural electrical impulses. A microcurrent face lift is a non-surgical, non-invasive cosmetic technique that safely and effectively improves the health and appearance of the skin . It removes dead skin cells, smooth wrinkles, pimples and clears the complexion. Miscrubber technology uses ultrasonic waves to shake loose dead skin cells, it also create heat and vibration to give a pleasant massage which will drive creams and ampoules into the skin. Tube to product high frequency current, and apply to the face, thus achieves the result.